What you like in your coffee? It’s probably cream and sugar. Maybe it’s strong and black? In your life, you've probably provided your coffee order more than a million times. This order might seem like a simple statement, one you might even take for granted, but it’s the key to a good morning. For someone with a communication disorder, like aphasia or verbal apraxia, a coffee order is the morning’s first opportunity to communicate. Because words can be difficult to find or understand when you have aphasia or verbal apraxia, it can also be the first opportunity for frustration and confusion. That’s where we come in. In the United States, more than two million people have aphasia, a communication disorder acquired as the result of a stroke or a brain injury. Of this population, thousands use augmentative and alternative communication (AAC) devices or speech-generating devices (SGD) to supplement their language and communication. Many of them use a Lingraphica device. Lingraphica’s AAC devices, most commonly referred to as speech-generating devices or SGDs, are language systems and designed with more than 9,000 icons representing common words and phrases. Our SGDs have an operating system that are easy to navigate and use. This is important because adults with aphasia some times cannot communicate without it, which means that the always-important coffee order may be misunderstood without a device. Although the speech community is aware of AAC, many people don’t know what an SGD or AAC device is or what it does, and we’re working hard to change that during International AAC Awareness Month. This month, we are sharing facts, and raising awareness of the issues and questions facing SGD users and speech-language pathologists. 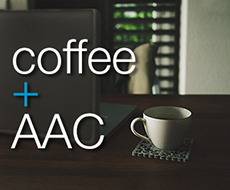 We want doctors, nurses, and even baristas to know and understand AAC. Here are some simple facts from the International Society of Augmentative and Alternative Communication (ISAAC) you can share with your friends and family to help raise awareness. AAC is a set of tools and strategies that an individual uses to solve everyday communicative challenges. Communication can take many forms such as: speech, a shared glance, text, gestures, facial expressions, touch, sign language, symbols, pictures, speech-generating devices, etc. Everyone uses multiple forms of communication, based upon the context and the communication partner. AAC can also be part of a language system in a dedicated speech device. If you want to learn more about Lingraphica’s AAC devices, you can call our team of specialists at 888-274-2742. Also, don’t forget to check back during October for more information about AAC and SGDs!